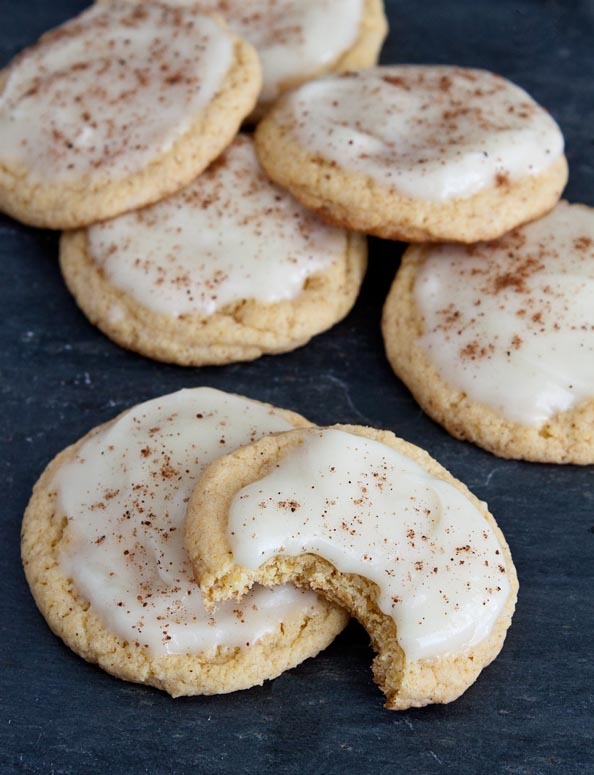 Eggnog cookies made with a cake mix! I’m thinking December is a busy month for you. Am I right? You’re probably hunting for gifts for everyone on your list, planning your holiday meals, making travel arrangements for family, buying and selling a house and moving in 30 days, etc. Wait, is that just me on the last part? Yeah. We had a whirlwind of a trip to St Louis a few weeks ago where we looked at 64 houses in 13 different areas in 4 days…and oh, bought a house on that last day. Everyone involved is shocked that we made a decision so quickly, but for one, the Lanes know what they want when they see it. And two, I’m so incredibly lucky that my husband and I have the exact same taste. I took two steps into this gingerbread-style house that was built in the 1920s and fell in love. I didn’t even walk out on the front porch or look in the closets before declaring that I love it, it’s perfect, and want it to be mine. Just one hour later, and we are completely buried in paperwork. So, if baking could be a little easier lately by using cake mixes, I’m all over that. But, I still only want mini desserts to serve two, so I divided up a yellow cake mix to give you a few desserts. This week, I’ll be bringing you desserts for two using a cake mix! Are you as excited as I am? Welcome to the cake mix chronicles! I did the math for you: each cake mix contains 3 cups of dry mix. 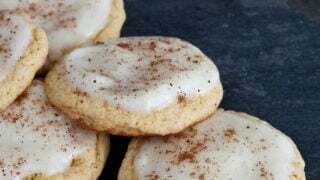 I bought Pillsbury Moist Supreme yellow cake mix to make these eggnog cookies. Any plain yellow cake mix will work, but don’t buy a cake mix that comes with pudding, fruit, or any other type of pouch to add to the mix. Just plain.dry.yellow.cake.mix. With me? First up: frosted eggnog cookies. You only need 1 cup of dry cake mix from the package. Save the rest of the cake mix for another recipe later this week. You’ll use the eggnog both in the cookies and in the delicious frosting recipe, too! Other cake mix recipes to use up the rest of the box: Cranberry Vanilla Dream Cake, Chocolate Cake Mix Waffles, and Chocolate Petit Fours. In a small bowl, stir together all ingredients with a wooden spoon. Do not overmix. Divide the cookie dough into eight balls, and place on a lined baking sheet. Bake for 9 minutes. Let cool for 2 minutes, then move to a cooling rack to cool completely. Before serving, make the frosting by beating together the powdered sugar and 1 tablespoon of eggnog. If the frosting is dry, add another tablespoon of eggnog to get it going. Frost the cookies and decorate with extra nutmeg. Wow, congrats on finding a house!!! SO excited for you! Aww, congratulations! A gingerbread-style house? That sounds so you! Congrats again, super exciting news! And I’m with you on looking for any dessert that will make my life easier this time of year. These cookies look divine! Yay, I’m so glad you found a house you love!! Which neighborhood did you end up deciding on? I just spent some time in the Central West End this weekend, so I think it may be back on my list to look at for when we move! Oh girl. If only buying a house were that easy for us! I found one that I love but my hubby doesn’t love the yard, so it’s looking like a no-go. We are usually on the same page, but this time around we’re a lot pickier about it! I hope you do another home (or at least kitchen) again! Congratulations! I had to laugh, because your the only other person that I know that buys a house just like I do! I’ve made my realtor show me up to 40+ homes, and he was like “seriously?”, and I was like “I’ll know it when I see it”, when I bought my second home from his firm, he handed me off to someone else and was “here, she’s yours….” and that’s just how it goes. I’m so happy for you both, we can’t wait to see pics! I’m not usually a cake mix girl either, but I am definitely gonna have to give these a twirl…. Happy Holidays! Wow, congratulations on the house! Sounds like you found a great one. These cookies sound delicious, too… I like the flavor of eggnog, but I find it a little strong just drinking it straight. Cookies seem like the perfect solution! What a great way to use cake mix, I love it! Oh my gosh, I am SO excited for you!! I just know that I would fall in love with that house too. And I am BEYOND excited to see your cake mix recipes. This one looks fabulous!! Congrats on your new house!! I hope the rest of the paperwork goes smoothly for you! 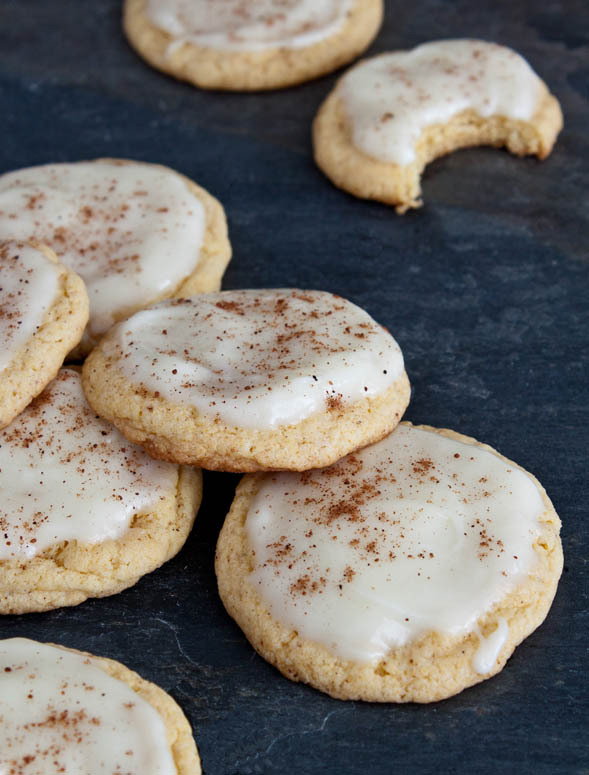 These eggnog cookies are the perfect use for cake mix! I’m all for cake mix concoctions this time of year!! Nail. Head. Yay on the new house! Love recipes with cake mix. I think they make cookies so delish! This is such a great idea! Those cake mixes are often by one get one so we tend to have extras and I never know what to do with them! Congrats on the new house!! What a simple cookie recipe. I think even with the new baby, I could so find time for these guys! Also, a BIG congrats on getting a house!!! I have friends in STL and in Maryville which is pretty close to STL so let me know if you are ever looking for some good places to dine or drink. I love any way to dress up a box mix! These are definitely going on my holiday to-bake list, pending baby girl doesn’t make an early appearance. I’ve always wanted to live in a historic gingerbread-style house – jealous! But moving during the holidays?! Sheesh! You’re brave!! :) Best of luck! These look so good!!! I love a small batch of cookies! Good luck with your move! I love this!! Looks delicious and obviously easy. Good luck with moving! So happy you guys found your house! These cookies definitely sound like the perfect treat for the holidays! So exciting about the house! And these look awesome, yum! Congrats on your new house! How exciting. These sound delicious! Congratulations on a new house. I love old houses, they are so charming! These cookies are so easy to put together for a Christmas party. Thanks for sharing! Congrats on the house! It’s so great that you have the same taste – that certainly makes these easier. :) I have to admit that I finally gave the cake mix in a cookie thing a try, and I’m hooked. It really does make things simple, and I love the flavors in this version! Congrats on your home!! That is incredibly exciting! I hope everything goes will for you! I have to admit, I love cake mix cookies! You cant’ beat the ease. This eggnog version is divine! So I love these cookies, I’d like to make them for a cookie exchange party I am going to this weekend. However, I need to make 7 dozen. Should I just multiply this receipe by ten? Any suggestions? Good receipe! How easy is this?? The house sounds adorable.Congratulations! I hope pictures will follow once you are moved in and settled.I hear St. Louis is a friendly and welcoming city. Can’t wait to try these cookes. Anything eggnog has my name all over it. As you so fondly tweeted me, #incrediballs. Incrediballs so appropriately describes these cookies which have me salivating for some nog right now. Also, I promise never to use the word ‘nog’ again. Anyways, can I come live with you now?? CHRISTINA, I MADE YOUR ‘FORGOTTEN COOKIES’ (in your book) yesterday… today I took them out of the cold oven… Oh my goodness… they are DELICIOUS! My husband who refuses to eat meringue cookies, loves them, too! I’ve always wondered what to do with one left over egg white… now I know. Didn’t know where to post this comment (it’s not on line, just your Book)… I thought you’d see this if I posted it under cookies. I’ve made 3 of your desserts so far… all delicious. Thank you.